Soak up the sun just steps away from your Villa Mare condominium located in the heart of Highland Beach, Florida. Villa Mare condos are located between the Atlantic Ocean and Intracoastal Waterway directly on the sand in Highland Beach. Villa Mare residents appreciate the stunning views of the water daily from the 31 condos that comprise the building. Condos for sale in Villa Mare come with the most magnificent upgrades. Features like open floor plans, wooden cabinets, granite countertops in huge kitchens, crown molding, marble floors, new appliances, private balconies and so much more! Every Villa Mare Highland Beach resident is treated like a guest in a 5-star resort. Residents can lounge by the private beach, relax on the sundeck by the gorgeous swimming pool, or get together in the clubhouse that is fit for entertaining. Amenities also include a fitness center, sauna, storage room, and full-time doorman. Outside the community, there are many places to explore. 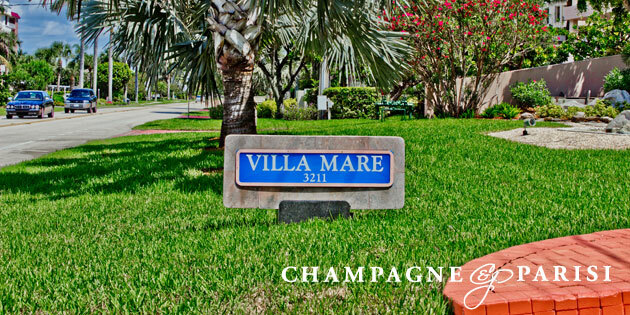 Villa Mare Highland Beach is centered between Delray Beach and Boca Raton, to cities filled with activity. From the famed Downtown Delray Beach Atlantic Ave, to Boca’s upscale Mizner park and every shopping center or fine dining establishment in between. Villa Mare Highland Beach residents will never be disappointed. There is so much to see on and off the property.